Because we’ve just launched, we would really appreciate your support by visiting the page and clicking the “LIKE” button. This is pretty cool news, y’all. 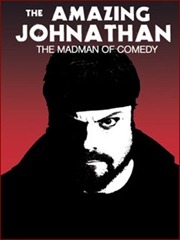 The Amazing Johnathan, the first Strip entertainer I insisted we see when we moved to Las Vegas, is going to be appearing LIVE on Awkward Silence. AJ (that’s what his friends call him) will find himself in a “No Holds Barred. No restrictions” interview with our host-with-the-most, Brian Mollica. AJ will be on the FEBRUARY 3rd, 2011 Awkward Silence episode, which starts LIVE at 6PM (PST). If you’ve ever wanted to ask AJ a question (like, “where’s the best place to go bandana shopping?”), THIS IS YOUR OPPORTUNITY TO DO SO! 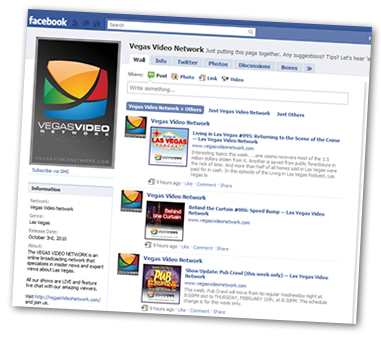 When it comes to great Las Vegas Video, we’re working hard at the VEGAS VIDEO NETWORK to develop great content. With that great content comes the hope that we attract great sponsors to the network and our shows. I’m proud to say that with the New Year comes a new sponsor for the VEGAS VIDEO NETWORK. We are very proud to be working with Dr. Richard Rothman and LASIK of Nevada. In practice for over 20 years, Dr. Rothman has performed over 30,000 40,000 LASIK procedures and is the most experienced LASIK surgeon living in Nevada. I’ve known Dr. Rothman for several years now and have been impressed with his practice and the testimonials he continues to receive. Speaking of testimonials, the LASIK of Nevada ad we’re running features Academy Award-nominated actor Chazz Palminteri, who flew from New York to get his LASIK procedure done by Dr. Rothman. As part of LASIK of Nevada’s sponsorship, I asked if they’d offer VEGAS VIDEO NETWORK viewers special pricing. . .and they agreed to do so! Simply visit LasikOfNV.com/VVN and you’ll see that in addition to 50% off premium LASIK, if you mention “VVN”, you’ll receive another $200 discount! If you’re considering LASIK, be sure to include Dr. Rothman and LASIK of Nevada in your research! I just saw this on Twitter, which lead me to a Las Vegas Sun article about a robbery that happened this morning at 3:50am at the Bellagio. According to the article, a man in motorcycle garb walked up to a craps table, pulled a gun, and demanded chips. He was seen fleeing on a motorcycle, heading westbound on Flamingo. Police think the robber is the same person who robbed the Suncoast casino (located in Summerlin) on December 9th (stole less than $20k). We just launched the latest show on the VEGAS VIDEO NETWORK, called Cup of Morning Sunshine. The show is a LIVE and video-on-demand production that features the good things in life! Through a series of short, entertaining, and educational video episodes, our goal is to help make both your personal and business life a little bit easier and a lot more fun by highlighting the ideas, people and organizations that make life great! Here’s a link to the premiere episode. Take a break from your busy schedule and spend 12 minutes basking in some sunshine of your own! Melissa just sent this to me. Today, the groovy folks at Cirque opened up a special offer for Nevada residents on 85.71% of their Las Vegas-based shows. (That’s 6 out of 7. Can you guess which one isn’t included?) The offer extends all the way until February 28, 2011! As part of the Living in Las Vegas Podcast‘s addition to the VEGAS VIDEO NETWORK, we’ve decided to switch from an audio podcast to a live streaming video show that will be available as a video podcast as well. After launching the network and several shows (Pub Crawl, Getting REAL (Estate) in Vegas and Strip Search! ), we’re about ready for our closeup. Hope to see you there! We’ve got a lot to catch up on! Where’s the Next Living in Las Vegas Podcast? What is Happening? As many of you have noticed (by the way, I understand the emails and voice mails, but sending a big scary guy to the house was a bit much, no? ), it’s been quite some time since our last podcast episode. And while we’re not know for the frequency of our episodes, I do have an excuse. I’ve been “heads down” since August 2nd on the VEGAS VIDEO NETWORK. I think it’s going to be a big deal. I hope you feel the same. Please sign up. You’ll like it, I promise. I had heard earlier this month that a lion attacked a trainer at The Lion Habitat at MGM Grand. Come to find out, a tourist was shooting video when it all took place! The attack begins off camera. It appears the male lion decided he’d had enough of the thinner trainer. After the initial attack, the lion and trainer are separated only for the lion to go after him again a bit later in the video. Here’s a thought – let’s stop thinking that putting a wild animal in an unnatural environment isn’t going to eventually piss it off.